Horses and people have enjoyed a longstanding relationship throughout history. Horses have helped mankind by plowing fields, providing transportation and, in recent years, providing riding therapy for disabled people. 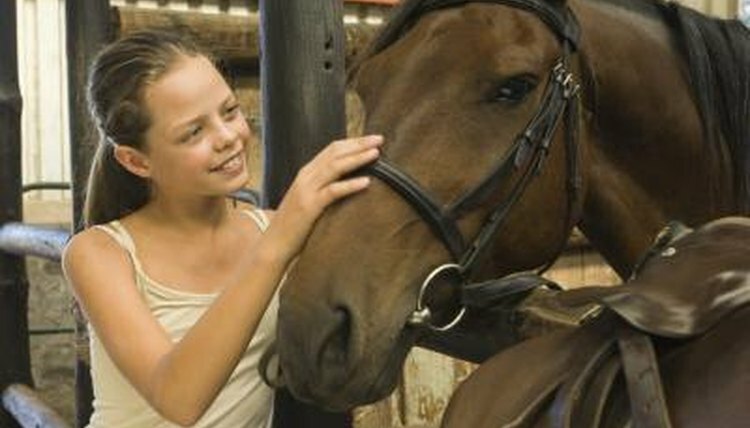 Although many factors, such as training and age, determine whether a horse is friendly, some breeds are more accustomed to people. The miniature horse were first introduced to America in the 1930s as pit ponies for coal mines. His breeding started with the Shetland pony, and he stands under 34 inches and comes in a variety of colors. Although he cannot be used as a riding horse, he can be owned as a pet. His friendly and charming personality also makes him well-suited to be a therapy horse, enriching the lives of the disabled, sick children and senior citizens. Unlike other horse breeds, a mini, as he is commonly known, is not measured by hands, but by inches. Hailing for Norway, the Norwegian fjord is a muscular horse who got his start working side-by-side with farmers needing help pulling a plow. The fjords, domesticated more than 4,000 years ago, is one of friendliest and gentle breeds available. In addition to being a valuable therapy horse, he has a smooth gait that's similar to a human's walk, thus providing a pleasurable riding experience. His pure breeding lineage has protected his appearance from having many variances, giving him distinct blond hair with a black stripe down his back. He stands between 13.2 and 14.2 hands in height. The quarter horse is one of the most popular breeds in America. This is due to his multipurpose ancestry providing work, pleasure riding and short distance racing. He became an official breed in 1940 with the development of the American Quarter Horse Association. His breed’s long history of interacting with people has left him with an easygoing temperament suitable for anyone seeking a friendly horse. Standing 14 to 16 hands high, he comes in 16 colors, including black, brown, chestnut and palomino. The Tennessee walking horse was first bred in the 1800s in, as his name implies, Tennessee. His lineage comes from several breeds, including Morgans and Canadian horses. This majestic horse is famous for his leveled, upright gait that delivers an easy riding experience for people. In the days before automobiles, he provided smooth transportation for travelers. He stands 15 to 16 hands high, and his coat comes in five different colors such as black, sorrel, and chestnut. With quality care, horses live to be more than 20 years old. Keep in mind that the breed of a horse does not matter as much as his early training and interactions with humans. As tempting as it may be to purchase a young horse, he won't begin to exhibit his full personality until after his first year of life, so choose one that is at least 2 years old. Observe the horse in his stable and ask the trainer to touch him and let him out to run. It's a good sign if he's happy and curious around people, but if he seems nervous and uncomfortable with a human touch, he may not be the horse for you no matter what his breed. What Breeds of Horses Did the Indians Have?